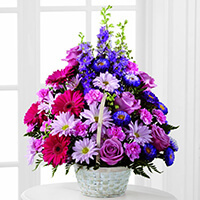 Provide comfort for the family of Attoway Helen Arnold with a meaningful gesture of sympathy. Survivors: husband, Gordon Arnold, Jr.; sons, Robert Arnold, Gordon Arnold, III and wife, Tina; daughter, Robin Harville. 12 grandchildren, two great-grandchildren. Two sisters, June Dalton and Beulah Collins; brother, Buster Hensley. Several nieces, nephews and other family members and a host of friends. The family will receive friends 12-2 Saturday, April 13, 2019 with funeral service to follow at 2 P.M. Saturday Clinch Valley American Christian Church, Highway 25-E, Thorn Hill, Rev. Darrell Hensley officiating. Interment will follow in the church cemetery. Pallbearers: Brandon Harville, Seth Franklin, Chris Dalton, Donovan Arnold, Dylan Arnold, Caleb Long. Arrangements by Cooke-Campbell Mortuary, Maynardville. We encourage you to share your most beloved memories of Attoway Helen here, so that the family and other loved ones can always see it. You can upload cherished photographs, or share your favorite stories, and can even comment on those shared by others. Ricky and Deanna Jandrew sent flowers to the family of Attoway Helen Arnold. Ricky and Deanna Jandrew purchased the The FTD Pastel Peace Basket for the family of Attoway Helen Arnold.